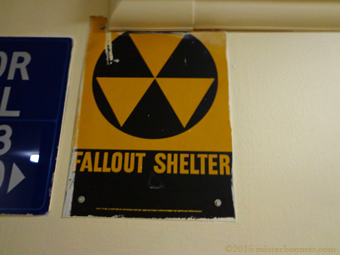 Having lived through the Cold War, boomers remember Fallout Shelter signs on government buildings, large office buildings and apartment complexes. Yet most boomers, having lived through the origin of the signs, do not know the history behind them. A Fallout Shelter sign was a public notice of emergency shelter, presumably in case of nuclear attack. The government-issued signs were iconographic and simple in their design: three yellow downward-pointing triangles contained within a black circle resting on a yellow background. Below were the words, “Fallout Shelter.” Additional messages on the sign could offer an occupancy capacity or directional arrows. Within a decade after the end of WWII, advances in technology enabled the two remaining world Super Powers to build long-range missiles capable of delivering atomic destruction over great distances. By the 1950s, the Cold War emerged as an arms race, with each country wanting to keep a balance of power — as in matching the other’s number of available nuclear warheads — as a deterrent. An attack by either could result in the total annihilation of their respective countries, if not the entire planet. Fear began to grip the American public at the prospect of an attack via the U.S.S.R.’s ICBM missile system. Early Baby Boomers recall the national 1951 “Duck and Cover” program at school, where they were told to “duck and cover” should they see a nuclear flash of light. It was apparent early on that this type of action was not going to offer enough protection. As a result, plans circulated for home fallout shelters, and pre-fabricated shelters intended for home use were also made and sold. Government officials were concerned about the rising national debate on the morality behind neighbor against neighbor — those with shelters vs. those without — should an attack occur. It was decided a system of public shelters, with each having a capacity of 50 or more, should be instituted. The country had a shelter system in place for years before WWII. These shelters, marked with a sign containing a large “S” and the words “Public Shelter,” were intended for use in instances of natural disasters, then as bomb shelters during WWII, should the homeland be bombed by enemy planes. Widespread bombing on the mainland did not transpire, though we now know the Japanese military did undertake a mission to bomb the Northwest states near the end of the War. All but abandoned after the War, President Kennedy assigned the responsibility of re-establishing this shelter network to Civil Defense, a branch of the Department of Defense (DOD), and asked Congress to authorize funds to create signage and stock these shelters with provisions that included water, food, first aid kits, communication equipment and other things considered essential for survival. There are six points to the shelter sign. They signify: 1. Shielding from radiation; 2. Food and water; 3. Trained leadership; 4. Medical supplies and aid; 5. Communications with the outside world; 6. Radiological monitoring to determine safe areas and time for return home. This explanation, however, was not communicated to the general public. In December of 1961, the DOD unveiled the new Fallout Shelter sign to the wire services. As newspapers began to disseminate images of the signs along with government-supplied information on what to do in case of an attack, the first sign was installed in a building in White Plains, New York. In less than a year, the signs could be seen across the country. The ubiquitous signage was immediately recognizable then as it is to people of a certain age now. The DOD was still distributing the signs as late as 1977, and many remain visible in all parts of the country. Many Fallout Shelter signs can still be seen, including this one that Mister Boomer passes every day. Mister Boomer did not actually know of a family who had a home fallout shelter, so the national system was going be the best his neighborhood could do. For Mister B’s family, the basement of the house would have to suffice. In the late 1950s and early 1960s, his parents began to stock a storage area in the basement of the house with SPAM, canned vegetables, gallons of water and jars of other canned items. The canned items came mostly from Mister B’s grandmother and aunts, as his mother did not take to canning fruits and vegetables like other members of her family. Though the spectre of nuclear attack was evident in the creation of the family’s emergency stock, it was also a practical precaution as Mister B’s area was prone to both floods and tornadoes. Cans would be rotated to upstairs use every few months, and Mister B remembers his father replacing gallons of water a few times, before the family abandoned the practice entirely in the mid-60’s. By then Mister B, like a good many boomers, heard the scuttlebutt around school that in the event of nuclear attack, none would survive in his region. A newspaper report had indicated the targeting positions of Soviet Union missiles, and his area was directly in their sights since it contained so many factories. Local steel mills, a paper factory, and airplane and auto plants were prime targets for an enemy bent on disabling a country’s ability to wage war. Mister Boomer made notice of the Fallout Shelter signs, but like many boomers at an early age, did not think that these shelters would mean the difference between surviving an attack or not. Boomers lived their lives with the ever-present possibility of nuclear attack hanging over them, but they pressed on, not thinking much about it or the Fallout Shelter signs that dotted the cityscape. What experiences do you recall with Fallout Shelter signs, boomers?